Here is the perfect gift for the new golfing baby boy and his family. 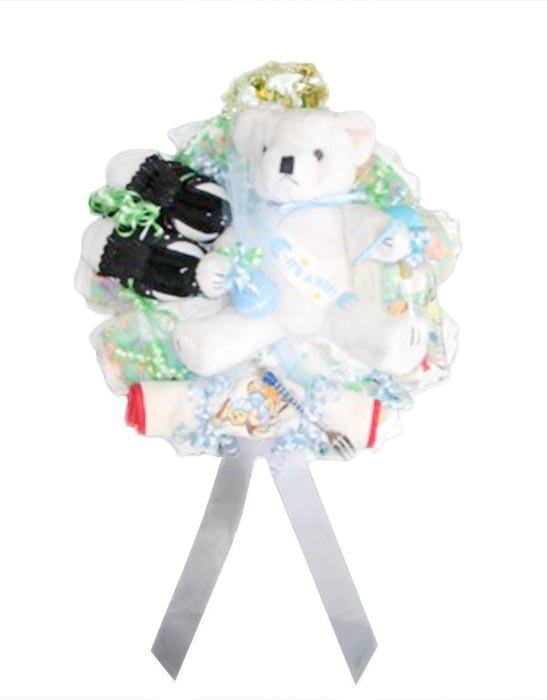 Everything in the diaper welcome baby golf wreath can be taken off and actually used. Not a thing on it is wasted. 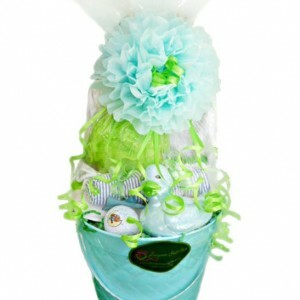 This welcome diaper wreath is the perfect “green” golf baby gift. Initially it can be hung on the door at the hospital to announce the arrival of the new “little pro” and later be disassembled and used for practical purposes. 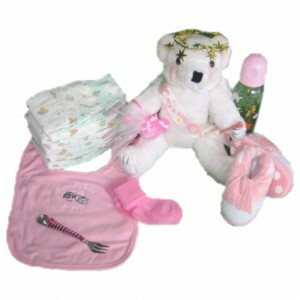 • The “golf angel” bear can be used to decorate the baby’s room and bring good luck and straight shots to the “new to the tour” baby golfer. 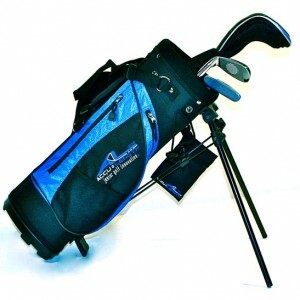 • The golf bib can be used to catch those spills that might mess up the golfing attire. • The “tee” fork can be used when they are a little older to feed yummies and remind them of the all important tee time. 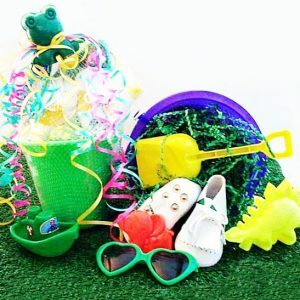 • The “water hazard” (swim with the fishes) baby bottle can be used for their favorite beverages and get little pros started thinking about the concept of the 19th hole and fun times with good friends at the end of a great day. 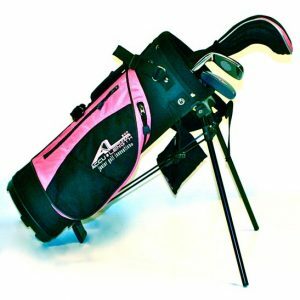 • The golfer’s slipper’s and socks can be used to keep feet warm and snuggly and also get those little golfer’s feet off on the right foot on the “cart path” of life. 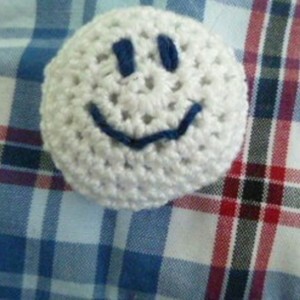 • The “It’s a boy” golf ball can be used by Dad to remind all his golfing friend’s that there’s a new little golfer in the family. 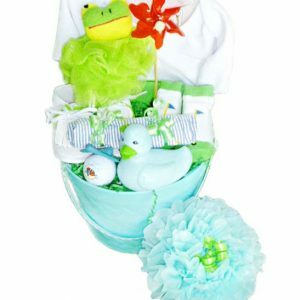 • Finally the wreath’s dozen diapers can be taken off and used for changes at the club house turns that are so essential to keep new little golfer’s happy and fresh for the next round. 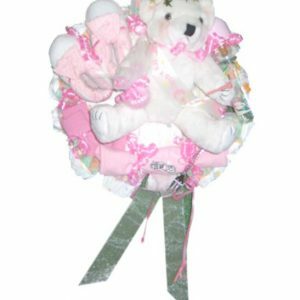 This baby golfer’s wreath is so cute, you’ll want to get one for every new to the tour baby golfer in your life. Supplies are limited so, get your wreath now so you won’t be disappointed later. Category: Baby Golf Gift Baskets.